The University of California San Francisco will hold a live Symposium on preparing for the Zika Virus today from 10am to 3:30pm Pacific time. You can watch the streamed web cast at this link, or by clicking the image above. Come back here on March 7 at 10 a.m. to watch the livestream of the Zika virus symposium and participate in the question-and-answer portions of the event. 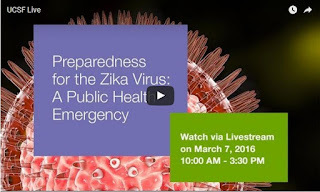 UC San Francisco is hosting a symposium about the preparedness for the Zika virus on Monday, March 7. The event, which will be available to watch on a livestream, brings together researchers from UCSF, UC Berkeley, UC Davis and Stanford University as well as public health officials. Topics for the Zika symposium include epidemiology and prevention, basic science of the Zika virus, vector biology and control, clinical management, and policy.